There are other ways to play your favourite games on the mac without leaving OSX to bootcamp back to windows. I tried parallels. At first, I was thrilled and excited, but then I was as annoyed as bootcamping and more(its slower than windows on bootcamp). It is an impressive piece of software but I still had to load an entire Operating system even if the loading took place on a virtual machine. I then tried Crossover games. For this paragraph i 'll just say that lotsa Orc-slaying is taking place using Crossover. Lately I am hooked on Lord of the Rings Online (more on that in a future post). Lotro occupies most of my gaming time and, at least for that one, I needed to find a way to play it efficiently on the mac without resorting to bootcamp. Crossover games was the answer. Even though tehcnically Lord of the Rings Online is not officially supported by Codeweavers it is still playing great. Installing it is straight forward once you know the correct steps. Basically the game plays as is. The only difference is that one has to replace the original .Net game launcher with another one that is compatible with Crossover. This is where pylotro comes into play. Make sure you download the windows pylotro version to install it in your bottle. I have been playing Lotro from crossover games for many days now and it is very stable with very good performance. In addition to Lotro I have been playing Team Fortress 2 and Half Life 2 from Crossover games without any issues whatsoever. Before trying it make sure to check on the compatibility pages if your game is supported. Ok I may bootcamp for something that is not supported but for 90% of the time I am ok. For 39 dollars being able to enjoy my favourite games without leaving OSX is a very good deal. Crossover has a full fledged demo version to try it before you buy it. In addition by buying a licence you support a company that supports open source and in addition writes a very important opensource project, wine. Good news everyone! 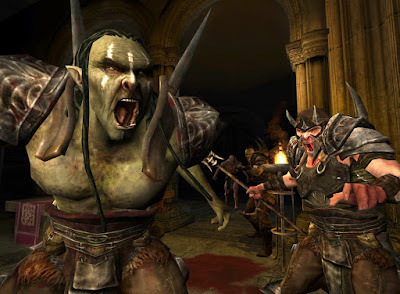 Codeweavers are now supporting Lord of the rings Online with C4P installation in crossover games. That means less hussle setting it up. It also runs like a breeze with 9.2. The installation process is a breeze now. Download the client setup files from the links found on the Tips and tricks page of the game's support page. Please note that there are different files for North American and European clients. This will install the Siege of Mirkwood client(don't worry you will update later). Do NOT use the latest free to play client because it will NOT work. Click on the the C4p icon on the right hand side of the page to initiate the automated installation procedure. Click through the security messages. Start the automated procedure and provide the lotro client location on your computer to the wizard. After the installation is complete use pylotro to run the game (the game's regular client won't work). If the game is not launching for you, check to see if DirectX modern package is installed in your lotro bottle in crossover. If it is not, install it through the supported installations of the bottle. Thanks for the very nice writeup on CrossOver and how to get LOTRO working under it. We are working on the launcher issues, believe me. I am happy that you appreciate it. Thanks for the information that you are working on the .Net launcher working. From the crossover forums I was very happy to learn that Lotro is considered to be officially supported. Unfortunately, Turbine has changed the installer and now uses PANDO. The third party installer is incompatible with Crossover. On Codeweavers site within the tips and trick sections there are some suggestions and a link to a forum post with the full compatible download. Sadly only the standard-Res is functional and not the HIGH resolution. Huge problem with the "Pando" issue and non-compatible game installer. How could this have been posted less than 24 hours ago and still not mention this obvious and terminal problem? You're instructions were quite good, made perfect sense, however; it's obvious that they were not tested even in the slightest. ...Well that's just pathetically convoluted and protracted and I see no reason why anyone would consider any of that helpful. You should not download the f2play clients but use the setup files from the links found on the tips and tricks section of the support page of the game on the crossover website. Ok, I updated the guide to make clear that you need to use the old installers. I am sorry for the inconvenience. This method is thoroughly tested since it is the one I personally used to install and play the game. The file being in a Australian server sure is problem. I have not tried this, but you could try moving the installation folder to your mac partition as is. Then, create a bottle for the game and install the rest of the necessary files like the visual c++ libraries, directx and anything else required. Move the game folder to the bottle and try to launch the game from there. Again this is just an idea and I am not sure if it will work. You can ask at the codeweavers lotro forum if anyone has tried it. could you make a copy of your mac workin lotro then open it, delete the lotro folder of the game, and then post it as is? should it be working? unfortunately it will not work that way. What will probably work though, is what i told you in my previous comment. You can use crossover to create this "wrapper" and move your lotro folder in the wrapper. You can also move your windows preferences by copying the folder with your preferences for windows' documents and settings to crossover documents and settings. um, unfortunutaly, it says that i need to not use a DOS thingy, and i have no idea how to get it to work, at all. i hit the download button, but it downloads in 5 seconds, and i cant open it. how can i get it to work? i have no idea what a DOS thing is. please help. what DOS thingy? are u sure you are refering to Lotro? I followed every steps, and it worked just fine, but I seem to keep getting corrupted .bin files on ALL downloadable files linked in the FAQ. Thus screwing the installation process. Do you happen to know where to download that older client? It's almost impossible to find! Thank you for posting this nonetheless. is worrked fine for me. Download from the netherlands server. If you still find yourself in trouble try using a download manager for your browser to make sure that nothing gets corrupted while you are downloading. It is fairly trivial to use the boot-camp version of LOTRO in CrossOver Games (CXG). 1- Create the bottle using cross-ties. This will install the PyLotRO launcher which is needed to run the game under OSX. You cam make a symbolic link from the bootcamp directory to the one under OSX, and the game will run fine. /Documents/The Lord of the Rings Online/ and can simply be copied from the same location under bootcamp to your OSX directory. One thing I forgot to mention in my earlier posting. Once you have installed a LOTRO client under CXG, the first thing you need to do is to patch it. Launch PyLotRO and use the tools pull-down, "patch." Click start, and go have a couple of drinks, dinner, dancing, whatever. ... the first patch run will take quite a while, on the order of several hours. Subsequent patch runs will take the same amount of time as they take no a PC ... dependent entirely on the size of the Turbine patch. Wierd I posted a third comment, and got an email bout it, but it isn't visible.... let me try again. First of all, I'd like to thank you for writing this up. It saved me a lot of time. I do have a question though. I noticed that you said that I only downloaded the Siege of Mirkwood client. How do I get the other clients like Shadow of Angmar and Mines of Moria? Will that come when I finish patching it? You do not need the other clients as the result would be to be updated to the latest one after hours and hours of patching. It does not matter whether you have(bought/unlocked) the expansions or not. The client is the same for everyone and depending on their subscription status the can or cannot see the in game content. So to save time from patching(which still takes alot of time) download the mirkwood client instead of the previous ones. I don't know the EU clients available. So I've run into another problem. I downloaded the right patch and applied it to the LotR bottle. The patch does its thing for a while but says "Failed!" when it comes to the downloading the sounds. I tried booting it up anyways and it gets to the title screen up to the point of "loading characters" or something, but then the screen goes black and I am forced to restart my mac. I don't think I have missed anything other than the failed patch. Is there a reason why it isn't finishing? and put it on the pylotro directory in the bottle. and click on the "advanced" checkbox inorder to specify the patchclient dll file. For more support on the patching process you can ask on the codeweavers lotro forum where the pylotro creator helps people having problems with that. Thanks for this beautiful peace of information I really enjoyed watching and reading. Cla Safflower Oil At that point you found the correct individual. I'll make weight reduction simple and agreeable for you... What's more, NOT BORING! Biogenic Xr Interestingly, MANY tribal cultures had been the usage of traction devices for years to lengthen their frame parts in all varieties of thrilling approaches. Cla Safflower Oil And maximum realistically, they assist you get out every day. Testro T3 What does this imply? do not purchase devices to help you alongside. Testx Core The loop presses the organ making it sore and blocking off the movement of blood. additionally this machine is made with an unsightly substance to maintain a discounted cost. So, I endorse the Jes Extender just for guys with a small purse. CLA Safflower Oil You should focus to what you eat, as well as to what you drink. Dermagen IQ A large portion of the fixings are man made, and practically useless to you. One indication of a genuine healthy skin item is that it won't Dermagen IQ for UK contain a solitary engineered compound, as every one of these fixings offer you are minute measures of cell reinforcements, vitamins, and other fundamental supplements. Dermagen IQ It is fixings like these which when consolidated together, frame the best antiaging dry slick healthy skin item. Since they work by assaulting the skin condition at the root level and totally wiping out the very reason for it, the outcomes are overpowering as well as are enduring as well. Rapiture Muscle Builder The muscle is Rapiture Muscle for Spain squeezed, shortened and put to work. Muscle fibers break down and then have to rebuild to keep up with the imposed demand placed upon them. D BAL Max nourishment is truly damn vital in the event that it is the primary building hinder that will be utilized to assemble your muscle. Xtrfact Do at that point? We work harder, longer; we increment the weight on our brains and bodies; we invest less energy . Nitridex human beings are nonetheless preferred to apply herbal meals to situation their minds. Zylix Plus Will mechanically stimulate boom in the Corpora Cavernosa that's a spongy tissue inside the that suggests you the bring about . Pleasant post. I was checking continually this blog and I am awed! Greatly accommodating data uniquely the last part I nurture such information a considerable measure. I was looking for this specific data for quite a while. Much obliged to you and good fortunes. Rapid Tone Weight Loss is a natural supplement which has been derived from the herb coleus Thermo Burn Review Weight Loss – part of the mint family of herbs – which can be found in Nepal, Thailand and Sri Lanka. In India, medical practitioners have used the herb for years to treat patients with heart disease, asthma, and other conditions. Researchers in the 1970’s isolated the chemically active ingredient in the herb and found it to have a positive effect on the muscles and blood pressure. During the 1980’s, 1990’s, and 2000’s, the supplement was used in nearly 20,00 studies because of its effect on a cell-regulating substance called cyclic adenosine monophosphate, or cAMP for short.